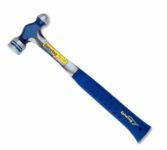 The Ball Peen Hammers have bonded and molded Shock Reduction Grip® which offers the utmost in both comfort and durability, while reducing vibrations caused by impact. Estwing hammers are the only hammers that can make this claim. The head and handles are fully polished and are forged in one piece.